Energy Medicine – Brilliant or Bogus? I have known Ren Fields for a long time. With her 50 years experience, 1,800 hours of training, a Certified Yoga Therapist, and owner of Healing Arts and Yoga (though she now teaches classes at Bodyworks), I have always thought of her as Fredericksburg’s queen of yoga. But when she, wife Paula, and I got together to indulge our craving for Indian food, at the Guru restaurant, she was telling us about the new therapeutic mode she is also doing. This sounded so unspeakably weird that I had to go find out more, and Ren kindly offered to give me a session for my edification. At her house, decorated with mystic tchotchkes and healthy house plants (you know the folk lore – don’t go to a doctor whose plants are dying) she asked me to talk about any concerns I was having. “How long have you got?” I asked her facetiously. But I specifically mentioned some weirdness with the way my stomach feels sometimes, accompanied by wide energy fluctuations which I have always attributed to Irritable Bowel Syndrome (doesn’t everyone have some IBS type stuff?). She started out scanning my aura running her hands over my arms and my sides – without touching me. She then interrogated different organs by seeing if the strength of my outstretched arm changed after she had worked on the appropriate place on the body that represented that organ. She paid special attention to my Ileocecal and Houston valves on each side of my lower abdomen – “resetting” them by drawing her hand upward, to help my colonic dysfunction she explained. After more manipulations and testing, she sent me home with some exercises. Funny stuff like “zip up” (pull your hands up your front and throw them out), to boost your confidence and clear your thoughts; “the Crown Pull” (pulling down on both sides of your scalp) to relieve headaches and “Wayne Cook“ that “focuses your mind and untangles inner chaos” (I might just be using that a lot). My understanding is the goal is to promote balance by opening the energy flow through the nine different energy systems – some of which were systems I’d heard of like meridians, chakras, but the Triple Warmer, the Celtic Weave and the Radiant Circuits were new to me. She also sent me home with Energy Medicine by Donna Eden, who is the pioneer of this therapy. Eden has the ability to see energy and thus devise beneficial exercises, Ren explained. I have to say as a doctor who has trained and practiced only allopathic medicine, this all seems a bit strange – I will refrain from using the word hokey, but I have to say, like many other alternative therapies, it is outside the bounds of conventional, documentable science*. And it seemed there is a lot of room for mind over matter. So the dilemma is, do I just blow it off as nonsense? 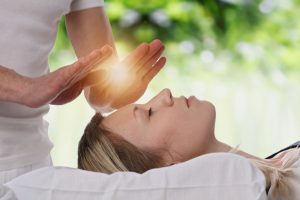 There are plenty of well established, respected systems of medicine, that work on enhancing energy flow – Acupuncture, Qigong, Homeopathy, Reiki to name a few. And Eden Energy Medicine is respected and practiced throughout the world. Very often such therapies don’t lend themselves to conventional clinical-trials, as does allopathic medicine, because of logistical problems, like standardization. And there usually isn’t a patent-able product, a pot of gold, at the end that some drug or medical device company can make zillions of dollars from – so no one’s going to pay for testing. *For more information on the claimed scientific basis to Eden Energy Medicine Ren recommends Energy Medicine, the Scientific Basis, by James L. Oschman, PhD, a doctor of Biological Sciences and President of Natures Own Research Association. Are You Being Treated by the Right “Gardner”?